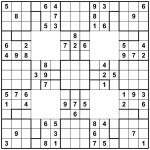 This entry was posted by Gareth Moore on April 12, 2009, and is filed under Gap Sudoku, Jigsaw Samurai, Jigsaw Sudoku, Samurai, Samurai Variants, Sudoku. Follow any responses to this post through RSS 2.0. You can leave a response or trackback from your own site. I really enjoyed this puzzle. I didn’t time exactly how long it took me to solve, but I know it was longer than an hour (I did it at midnight). I think it’s interesting that the 3×3 regions that contain the jigsaw pieces end up containing 1 through 9 as well. I might be more fun (and more difficult) to solve if you cut up all those 3×3 sections into more jigsaw sections. Thanks for the puzzles! I’m not surprised it took at least an hour – if anyone manages to solve it faster than that I will be very impressed! Fascinating observation about the unmarked 3×3 boxes that result between the other 3×3 regions – this had me confused for a little while (I’d managed not to notice it! ), but then I realised it was because of the pattern of alternating complete 3×3 boxes combined with the full columns/rows of 9 squares (a new column/row of 9 every 3 squares). It works out this way for the same reason that you repeat exactly the same triplet of numbers every 3 boxes in Samurai Star (Flower Samurai) Sudoku puzzles. Well then I am feeling very pleased with myself for once, as I managed to solve this one in 30 minutes! I did spend a few minutes first though colouring in all the regions as you suggested which certainly helped when cross-referencing digits! I don’t think it would have been so quick if I hadn’t had so much practice at doing sudoku star puzzles and toroidal puzzles. Once You get into the swing of looking for the blocks of three repeated numbers, the gaps fill in much quicker. I really enjoyed this puzzle = took me back to the days of the Mind Games magazine! 30 minutes is very impressive! You’re obviously up for a challenge on your Samurai Sudoku variants, so I’ll keep the variations coming! I just added a Skyscraper Samurai Jigsaw for a bit of variety, but it’s probably slightly easier than this gap jigsaw puzzle so perhaps that won’t provide much of a challenge? If you’d like another target to beat, the Skyscraper Consecutive Sudoku from yesterday (the 15th April) can be solved in about 15 minutes if you’re quick. I was very pleased how smoothly it broke – no need to write in almost any pencilmarks to get going (I think I wrote less than 10 throughout the whole puzzle!). And finally: hello again! It’s good to hear from you, and I’m glad you enjoyed the puzzle! Yes, BBC MindGames published more adventurous variants than any other magazine or newspaper! I’ve never actually done any skyscraper puzzles so doubt I will meet the 15 minute challenge on this one, but will certainly enjoy having a go at tackling it! It’s strange how some variations of the japanese puzzles come more easily than others. It’s really great to see some more adventurous puzzles though, so thanks for keeping the brain cells ticking over! Interesting idea. Figuring out regions was difficult at first as you mentioned. I also stumbled upon what Andrew said above and felt like I was cheating. Then I saw the pattern more and used it to finish the puzzle faster. I don’t feel I enjoyed it any more than the other sudoku types. It really breaks the KISS principle.